Or, our 24 Hour Service Line at (734) 424-1560. You can reach our office by calling (734) 424-9555. If you prefer to email, contact us here! "They did everything he said they would do and made a neat professional job of it. These guys have my highest recommendation." Call (734) 424-9555 today! Replacing your home cooling system can be a major decision; one you don't want to make based strictly on cost. Businesses recommended by CMR Mechanical. Fill out this contact form to see your online specials from CMR Mechanical. CMR Mechanical is a family owned licensed mechanical contractor based in Dexter, Michigan. We service your residential, commerical and industrial needs. "They were the most professional installations I've had in any of the homes I have owned over the past 30 years." Give us a call today! You won't regret it! "They were on time, did what was asked and charged exactly what they promised. I couldn't have asked for anything more." Call today! The local owner of CMR Mechanical, Andy Bobo, has joined a networking group in Ann Arbor, Michigan. CMR Mechanical will be participating in the 2014 Diamond Contractor Conference in Las Vegas, Nevada. Two CMR Mechanical Technicians receive Mitsubishi ductless air conditioner system training that will help boost troubleshooting knowledge. CMR Mechanical finishes a specialized heating and cooling design for a 7,000 square foot home after 10 months of planning and installation. CMR Mechanical is a proud sponsor of the Dexter Daze Fireworks along with The Kolb Company and Meijer. CMR Mechanical is a supplier and servicer of the new Cummins Bridgeway generators in the Ann Arbor and Dexter areas. CMR Mechanical Installs a Honeywell WiFi Thermostat that Talks! CMR Mechanical installed the new Honeywell WiFi Smart Thermostat with voice control in a Honeywell Executive’s home. CMR Mechanical helps a homeowner in need of a boiler replacement after an incorrect install. "I needed the right size system that could cool and heat the house without using too much battery power.” Find out what we did! "Great service, Great follow up, and Quality Products!" Give us a call today to schedule your service call! A list of helpful and informative articles, relative to CMR Mechanical and their products. Click on an article for more information. Improve Energy Efficiency with the Right Thermostat for your Home! "The team at CMR is amazing! Staff is prompt, courteous, and consistently goes the extra mile." "Andy came out ASAP to give us an estimate on a new unit and brought an industrial strength window AC unit to get us through until the real AC unit could be installed." "I’ll save you some research - Call CMR. CMR is a local, family owned heating and cooling company that provides high end service with INTEGRITY." Air Conditioner Covers and Cages: What You Need to Know! "Even though it was an extremely busy time of year, they came out quickly and fixed both issues. Very professional. " New Furnace Installation Cost: What’s a Fair Price? "I had air conditioning installed in ductless 1957 home. They were quick with quote, always on time and had it installed in a very short period of time." What Can You Do About Blocked Air Conditioning Drains? “I was extremely impressed by the service provided today by Scott B. and Charlie!" How to Reduce Asthma this Spring! “I have used CMR Mechanical for many years to maintain my steam boiler. They are very knowledgeable and, at my request, have helped me understand how to maintain it." Don't Forget to Get a Spring Tune-Up for Your AC! "I’ll save you some research - Call CMR. CMR is a local, family owned heating and cooling company that provides high end service with INTEGRITY. " Think your troubled sleep has nothing to do with the thermostat? Temperature actually plays a critical role in your body’s ability to settle into a good night’s sleep!
" You can trust that CMR has the expertise to solve problems without just saying, "Oh you need a new furnace." Call today! How Wi-Fi Water Sensors Can Help with the Maintenance of Your Home! "You can trust that CMR has the expertise to solve problems without just saying, "Oh you need a new furnace." Why Mitsubishi Electric is The Smart Heating and Cooling Choice! "They were on time, did great workmanship, and cleaned up. Can't ask for much more. Job well done. Great folks to do business with." "I was extremely impressed by the service provided today by Scott B. and Charlie! They were punctual, knowledgeable, professional, & courteous. " Types of Home Cooling Systems: What’s The Best Solution? "I was extremely impressed by the service provided today by Scott B. and Charlie!" Contact our experts today for a customized solution! Avoid a Furnace Repair with a Tune-Up! “Our furnace had stopped working in the night, so I called CMR Mechanical. They were to our house and had it fixed by 9 a.m.! " Air Conditioning Contractors in Ann Arbor Help You Decide When It’s Time to Upgrade! "Andy, the owner and Charlie, the main service guy are an absolute pleasure to work with and extremely honest!!!" Call today to schedule your $99 Clean & Check Inspection! Best Deal in Town! $99 Clean and Check on Your Air Conditioner! "They were quick, on time and had it installed in a short period of time, coordinating with electrician who worked with the same timeline, consulting me on every step." Don’t Overpay for an Air Conditioner Installation in Ann Arbor! "These guys were clean, fast and courteous. If you're in the Dexter/Ann Arbor area, use CMR. PERIOD!" Call now to schedule an appointment! "They were on time, did great workmanship, and cleaned up. Can't ask for much more." Call today to schedule a service call! Why Choose a Factory Authorized Bryant Dealer? "These guys were clean, fast and courteous. If you are in the Dexter/Ann Arbor area, use CMR. PERIOD." At CMR Mechanical, we’re the caring experts! Fix Your Never-Ending Furnace Fan Today! Furnace constantly running? Call us today to whip your fan into shape and leave you with a warm, functional home for the rest of winter! Do seasonal allergies have you dreading the return of spring? Follow these tips to improve indoor air quality this spring! Simple Tips to Improve Furnace Function! Is your furnace running in tip top shape? We’re your guys for furnace repair in Ann Arbor and the surrounding areas! Call today! Is your air conditioner in need of repair? Learn how to determine whether a repair or a new air conditioner is needed. Do you own an older home without ductwork? For information about Mitsubishi Ductless systems call (734) 424-9555 today! Do you need a furnace installation in Dexter or the surrounding areas? Call CMR Mechanical today at 734-424-9555 to schedule an appointment. Is Heating Your Ann Arbor Home a Constant Struggle? Is heating your Ann Arbor home a constant struggle? Call us today at 734-424-9555 to schedule an appointment! 7 Super Important Tips to Prevent Your Pipes From Freezing! Is your air conditioner in need of repair? Call CMR Mechanical today for honest, quality service in Ann Arbor and the surrounding areas! 5 Super Important Tips to Help Regulate Air Conditioning in your Ann Arbor Home! Is your home too cold in the winter and too hot in the summer? Read our super important tips on how to regulate air conditioning in your Ann Arbor home! What are the different types of water heaters? Are you unsure which water heater option is best for your home? Call our heating and cooling experts in Ann Arbor today for a home evaluation! Best Furnace Repair in Ann Arbor! "They make it simple! I know the products they use are quality, which means my investment will last." Call us today at 734-424-9555 to schedule an appointment. "Great service, Great follow up, and Quality Products!" We offer great value when it comes to air conditioning repair in Ann Arbor. Call us today! Don’t let the winter chill follow you inside because of a faulty furnace- call us at (734) 424-9555! What Does it Mean To Be a Bryant Dealer For Heating in Ann Arbor? Are you looking for a licensed Bryant Dealer to service your heating in Ann Arbor needs? Call us today at 734-424-9555 to schedule an appointment! How would you like to personalize your space? We’ll measure your home and survey your needs to recommend the correct heating in Ann Arbor to maximize your comfort. Does your house hold a lot of humidity? We'll measure your home and survey your needs to reccomend the correct system for you! We’ll measure your home and survey your needs to recommend the correct heating in Ann Arbor to maximize your comfort. Call us today! Are you looking for the best solution when it comes to heating in Ann Arbor? We’ll measure your home and survey your needs to recommend the correct system! What is Your Heating in Ann Arbor Service Life? How long will your heating in Ann Arbor last? Call us today at 734-424-9555 to schedule an appointment. 8 Common Problems with Boilers! Do You Need Boiler Service in Ann Arbor? We’ll measure your home and survey your needs to recommend the correct boiler to maximize your comfort. Call us today at 734-424-9555 to schedule an appointment! "I have had several service calls for my AC, and have received excellent service. I would highly recommend CMR!" Call today! There are various types of radiant floor heat that you can choose from depending on your needs. Call our technicians for a free in-home evaluation in Ann Arbor today! Boilers Verses Furnaces: Which is Better for Your Ann Arbor Home? Do you have high energy bills? Is your AFUE percentage lower than 80%, that’s a sign that your furnace or boiler is inefficient, and you should replace it! New home generators automatically start and stop when there’s a power outage, so you don’t have to worry about a brown-out. Call us today for installation! Are you looking for a heating and cooling system that provides comfort as well as better indoor air quality? Look no further than a Bryant furnace! CMR Mechanical would like you to learn everything there is to know about how an air conditioner works, and how it keeps you cool in the summer! Mini split systems reduce energy losses associated with the bulky ductwork from a central forced air system. Get yours installed today by mini split Ann Arbor specialists! According to Energy.gov, upgrading your HVAC to a new high-efficiency system can often cut your fuel bills and your furnace's pollution output in half. Mini-split system air conditioners are an option in older homes or businesses, because they don’t have ductwork to accommodate a conventional ducted system. Ductless air conditioners reduce energy losses associated with the bulky ductwork of central forced air systems. Call today to start saving on your energy bills! Air conditioning needs vary from place to place. Ann Arbor has its own unique climate considerations, including occasional severe winters and very hot, humid summers. A hybrid system will truly pay you back with greatly reduced energy bills! Find out how it can save you costs here! Helpful definitions of many terms and abbreviations used when talking about HVAC. Furnaces: What does 95% Efficient Mean? How much of the energy a particular furnace converts to heat, (and how much is lost due to the work required by the system), is known as "efficiency". Whether you need to repair or replace a furnace in an older home, or are in the process of designing the heating and cooling system this guide can help you! Have you considered a geothermal heating or cooling system for your Michigan home? Call today to schedule an in-home consultation! The Mini-Split systems from Mitsubishi are a unique kind of heating and cooling system for your home. They can provide both A/C and heated air on demand. SpacePak and Unico systems are special types of small-duct or mini-duct central heating and air-conditioning systems for your home or business. Do You Have Special Needs for Air Conditioning Your Ann Arbor Home? You might be surprised learn that your air conditioning in your Ann Arbor home works pretty much the same way your refrigerator works. Learn more here! Did you know that Honeywell makes a wide variety of products to help you keep your home clean, safe and healthy? Learn more here! Save Tips on AC for Your Ann Arbor Home! "Always cheerful, always polite, always competent - that's CMR!" Call today for a $99 clean and check inspection on your ac for your Ann Arbor home! There are several ways to get more control over your home heating bill. One way is to make your home as energy efficient as possible. Heating and Cooling Your Ann Arbor Home is What We Do Best! Nothing surprises quite like Michigan weather! CMR Mechanical can solve your heating and cooling challenges in your Ann Arbor home. It’s fall in Michigan and that white stuff is flying already! Are you ready for winter? Is your home’s heating and air conditioning system ready for the transition? Mitsubishi – the No. 1 Selling Brand of Ductless Heating and Cooling Systems! "I was extremely impressed by the service provided today by Scott B. and Charlie! They provided exceptional customer service. I will definitely be using CMR in the future and will recommend them to others." We’ll Customize a Solution to Fit Your Needs! "Had air conditioning installed in ductless 1957 home. They were quick with quote, always on time and had it installed in a very short period of time, coordinating with electrician who worked with the same timeline, consulting me on every step." Why a Mitsubishi Electric Hyper Heating System? "Our furnace had stopped working in the night, so I called CMR Mechanical and they were to our house and had it fixed by 9 a.m.!" Smart Phone App Control at Your Fingertips! "Andy took his time advising me and answering all my questions patiently . The installation was done very professionally and the installers both were great. I would recommend CMR to anyone. Very professional and trustworthy!" Do you want to get the best resale value for your home? Try installing a ductless heating and cooling system in your home to add value! How are ductless systems able to operate so quietly? Find out everything you wanted to know and more about ductless systems here! Are you tired of wasting money on your energy bills? Make the switch to ductless today! HVAC Buying Tips Everyone Wants to Know! No matter how large or small your project, we can help you complete the job from start to finish! Call us today! Let the local Ann Arbor experts at CMR Mechanical install a high efficiency furnace for you today in Ann Arbor, Dexter or Chelsea areas! You might be surprised to learn that your Ann Arbor air conditioning works pretty much the same way your refrigerator works. Gas Boiler products available from CMR Mechanical. The Mini-Split systems from Mitsubishi are a unique kind of heating and cooling system for your home. Have you considered a geothermal heating or cooling system for your Michigan home? Find out what you need to know here! CMR Mechanical is proud to represent Honeywell generators. Whether you are looking for an energy saving tankless on demand water heater or a standard replacement for your existing system, CMR has a solution to meet your needs. Even the cleanest homes have air quality issues. Find out why an air filtration system in necessary in any home! If your indoor air is overly dry, your family may experience discomforts like chapped lips, itchy skin or aggravated allergies. Call today! The many successful projects of CMR Mechanical. "Andy the owner and Charlie the main service guy are an absolute pleasure to work with and extremely honest!!!" Give us a call today to schedule your service call! We can make your home more energy efficient! 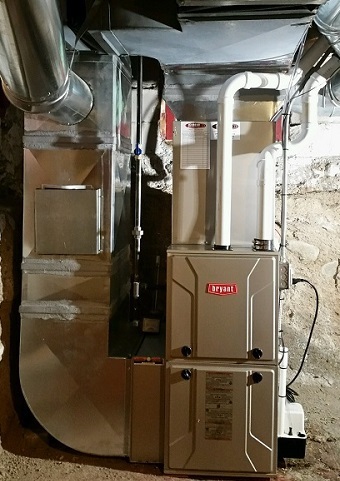 Read how we did just that by replacing an original 1975 Williamson furnace. "They're very knowledgeable and at my request, have helped me understand how to maintain by system!" Call us today for all your heating and cooling needs! In the market for a Mitsubishi Ductless air conditioner? Contact your local Mitsubishi Diamond Dealer in Ann Arbor at CMR Mechanical. CMR Mechanical installed a new ductless air conditioner at a Portage Lake home. Get the project details here! CMR Mechanical installs new mitsubishi mini split heating and cooling system for an off the grid cottage. Get the project details here! Trinity Lutheran Church consulted with CMR Mechanical to solve their boiler issues. Have a boiler problem? We can help! Completed in May 2012 this home heating and cooling system has many options. Read more here! We are proud to be actively restoring this property just outside the village of Dexter. CMR Mechanical was asked to install several heating and cooling systems. This new home, located outside Dexter Michigan required a high efficiency boiler with multiple zones. The homeowner added an air handler for air conditioning. Two 5 ton Climatemaster Geothermal systems were installed along side a 95% efficient Triangle Tube boiler. Learn more here! Replaced a Lochnivar Boiler with a new 95% Efficient Triangle Tube Boiler. This Boiler has Domestic Hot Water capability and it mounts on the wall to save space. This closed loop system was installed in the spring of 2011. The 5 ton system replaced two propane furnaces and two air conditioners. This Ann Arbor home was completely remodeled and the heating system upgraded to a 95% efficient Triangle Tube boiler. Photos show pex tubing used for heating. This home has hot water heat and the homeowners wanted to add air conditioning. The home didn't have ductwork and we were able to design and build a customized system. This is a replacement boiler system. A Dunkirk system replaced a 30 plus year old boiler. This is a collaboration of commercial heating in Ann Arbor projects that CMR has contracted. We offer service on any brand of heating,cooling, or refrigeration unit. The home had an existing ductwork system, but the ductwork had extensive mold issues and could not be used for air conditioning. Learn more! Climatemaster Closed Loop Geothermal system installation. These pictures show the process of putting in a geothermal system. Customer had an existing 21 year old Geothermal System that required the use of a drain field. The existing drain field was excavated and the material was removed. The homeowner requested the addition of A/C as well as a way to keep the home comfortable during the cooler months. Learn more here! It is extremely important to remember to include heating and cooling in your basement plans. Once the basement is finished, it is hard to go back. This is a garden shed that was turned into a writing studio. It is fully insulated and heated and cooled by a Mitsubishi Mini-Split with Hyper heat. The home has 16 zones that allow different areas of the home to be set and maintained at different temperatures depending on comfort levels of the occupants and flooring. See what people are saying about CMR Mechanical! At CMR Mechanical, we’re committed to providing the highest level of service and installation in the industry! Please leave us a review! Need a new heating and cooling system installed in your home in Ann Arbor or the surrounding areas? Call the experts! Building a new home, remodeling or just replacing your air conditioning system? We can give you the most efficient, reliable and durable products for your home. CMR Mechanical utilizes commercial split or package heat pumps, air conditioners, gas furnaces, and hanging unit heaters in buildings of all sizes. Call today! With proper cleaning and maintenance, your home heating and cooling equipment will give you years of dependable service.